Silicon Valley for three years. She has spent two of those years as a student ambassador where she helps with the student shadow program, open house and information session events, and in general extends hospitality to everyone she meets. 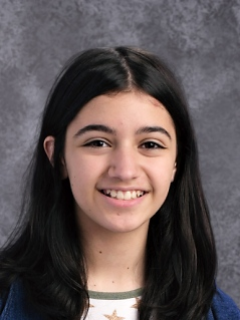 Meriam said that “BISV has a safe learning environment, free from bullying, where teachers help you learn, not just feed you information, but really help you understand.” She said that everyone is welcoming and friendly and that everyone works to respect each other, in and out of class. At other schools, Meriam felt teachers treated students “like a bucket to deposit information into,” especially when it came to math. “I hated math when I was in my other schools, despised math,” said Meriam “but after coming to BISV, I started having fun.” Meriam attributes this paradigm shift to the expertise of her teachers as Subject Experts and their truly dedicated and versatile teaching methodologies. Meriam also feels that the collaborative and friendly nature of students helps round out her rewarding experience. “My parents would always help me before, but now at BISV, I’m empowered to help myself. The model at BISV really encourages me to own my homework. I’m more responsible, independent, and I have the support to be successful,” said Meriam. In addition to her love of math and all things that have a logical progression, she really enjoys Drama. She says that classes like drama help teach to the whole student. Meriam said that they don’t just “perform pieces.” She thinks that students learn to assess and evaluate, to “understand the nuances of subtext” in a play. Meriam also said that she learns to empathize with the characters and her fellow thespians. In the morning, I have English with Dr. Jensen. In English, we learn advanced vocabulary, how to analyze and think critically about stories, and of course, learn about proper syntax and grammar rules. I feel well prepared because we have lots of assessments and plenty of writing practice. I’ve always made up stories since I was little and have loved writing all my life. What I love about English class is that it gives me a chance to understand what makes a good story, especially if it is a moral tale, or a cautionary story. Next in my day is Chemistry with Dr. Neff or Physics with Mr. Kaufman. What’s amazing about the way my teachers approach science is that it is highly interactive and participatory. Teachers and my fellow students value everyone’s input and we are encouraged to develop and argue for our own theories. I love learning about the intricacies of the natural world; how atoms, natural forces, work together, underpinning what we see and don’t see. I love that science reveals to us the invisible forces at work in our world and universe. I love anything dealing with Logic or Biology! So this part of my day is one of my favorites. I have Logic with Mr. Erwin or Biology with Mr. Nguyen (depending on the day). What I love about Logic is that it is a skill like any other, one that can be honed through the power of reasoning. For example, in Logic we are looking at how certain phrases within a culture can be misunderstood and why. As for Biology, I love learning how biological structures and systems work together. In all of my classes, we delve deep into our subject matters. The teachers really know the material and help us to understand complex ideas and information in a way that is relevant and fun. At lunch, it’s time to eat and share good food with friends and just relax outside. We have plenty of time to hang-out and enjoy a break. After lunch I have Algebra 2 with Ms. Kandic. We are currently studying imaginary numbers. I get excited when confronted with a difficult concept and then have to work through and understand the logical progressions. There’s something so satisfying about solving problems. The teachers here have opened a window into the world of mathematics and I love it now! At BISV, math is more than memorizing tables and formulas, its understanding the how and why of mathematics. We’re encouraged to try and fail, to iterate, to learn from mistakes. Next is Latin with Dr. Van Dusen. Latin helps me understand the roots of words. This is especially helpful in the sciences. Latin may seem daunting at first but Dr. Van Dusen does an excellent job at preparing us with in-class exercises and fun collaborative activities. Many of my friends at other schools are not afforded the opportunity to study Latin. It’s not a ‘dead’ language! I know, after having spoken with my teachers, parents, and people in technical and scientific careers, Latin is extremely useful to know. Drama is next with Ms. Washington. There are so many reasons why I love drama; I can express myself, learn to work as part of a team to tell a collaborative story, and so much more. I learn how to create a compelling plot and what makes a character three-dimensional. Drama allows me to step outside my comfort zone and stretch myself, not only as a writer, but as a performer. My last period is U.S. History with Dr. Witschorik, and most obviously, we’re looking at the historical context of the current election. We learn the historical context of the electorate and voting process, and what are the consequences of our voting or not voting. For me, history is not about dates and facts, it’s about how things are connected over time, how one thing influences another and another. I suppose this, too, is a class where my love of logical progressions plays out over significant points of time in history. To register for an information event, please click on the button below.